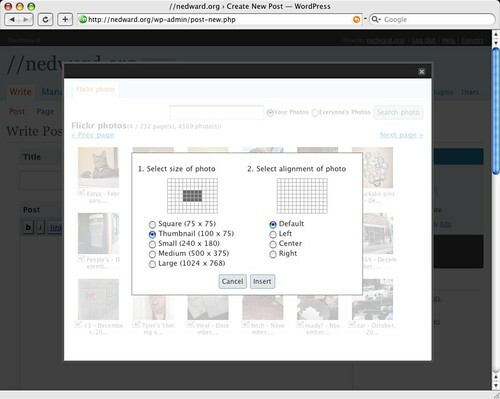 Click Insert, and the markup is dumped into your post, and you can con­tin­ue writ­ing. One pet-peeve of mine is that the markup isn’t cus­tomiz­able – for instance, it wraps the pho­to in <p></p> tags, and adds an inline float style if you choose to align left, etc. But that aside, this is a great plu­g­in. Hi, the plu­g­in looks great but I can­not find the link for down­load­ing it in the japan­ese web­site… Could you help me out? 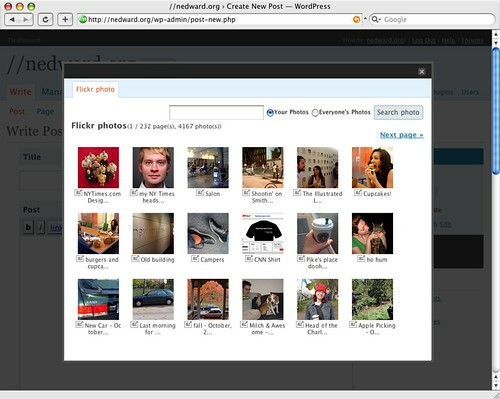 It is avail­able for down­load from the “WP plu­g­in page”:http://wordpress.org/extend/plugins/wordpress-media-flickr/, or direct­ly “here”:http://downloads.wordpress.org/plugin/wordpress-media-flickr.1.0.3.zip.